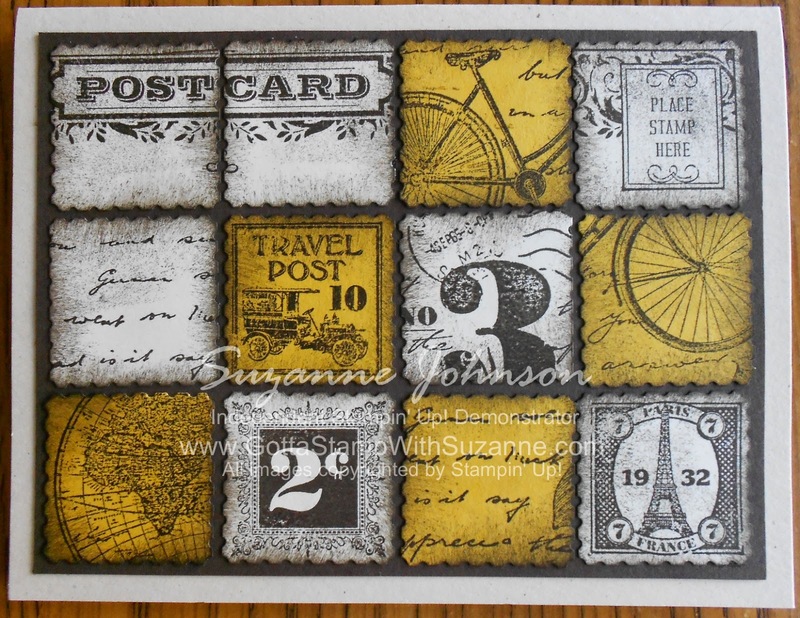 GOTTA STAMP WITH SUZANNE JOHNSON: IN COLORS POSTAGE DUE COLLAGE C.A.S.E. "POSTAGE DUE" and "POSTCARD" sets, Early Espresso ink (stamping and spoinging), Very Vanilla and Lost Lagoon cardstock for postage stamps, Early Espresso background panel and Sahara Sand card. 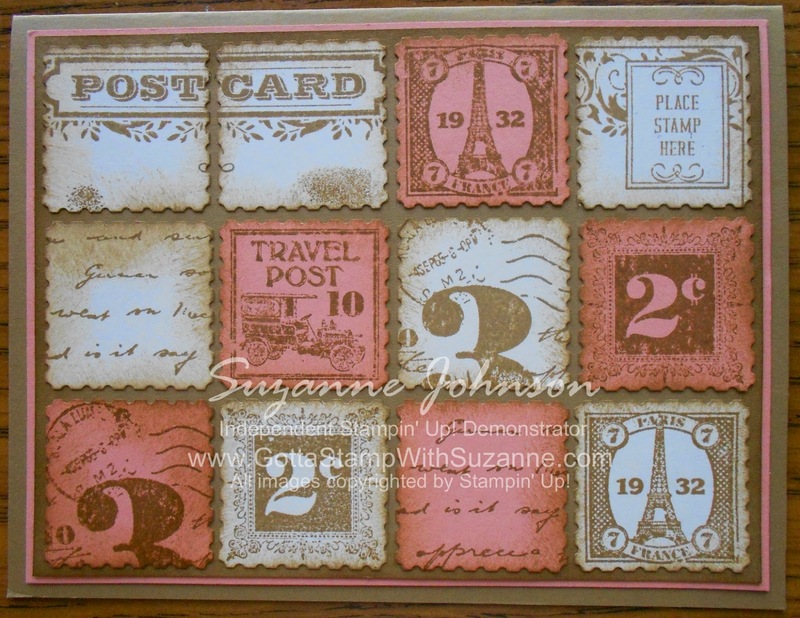 "POSTAGE DUE" and "POSTCARD" sets, Baked Brown Sugar ink (stamping and spoinging), Very Vanilla and Crisp Cantalope cardstock for postage stamps,Baked Brown Sugar background panel and card, Crisp Cantalope cardstock layer. For my next variations, I played around using more of the main image in "Postage Due," and brought in images from "The Open Sea" set. 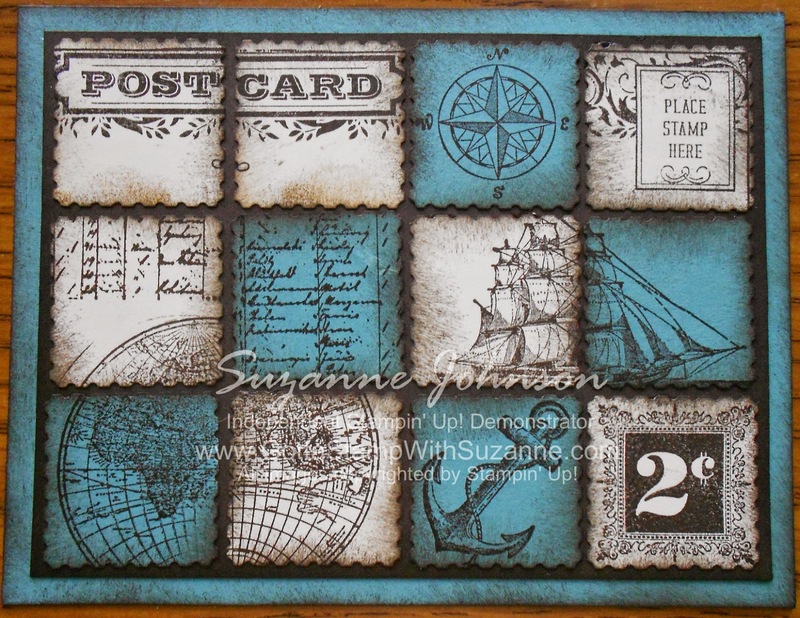 "POSTAGE DUE," "POSTCARD" and "THE OPEN SEA" sets, Early Espresso ink (stamping and spinging), Very Vanilla and Hello Honey cardstock for postage stamps, Early Espresso background panel and Natural Ivory card. In the variation below, I used some of the script image from "The Open Sea" instead of just the script in "Postage Due." 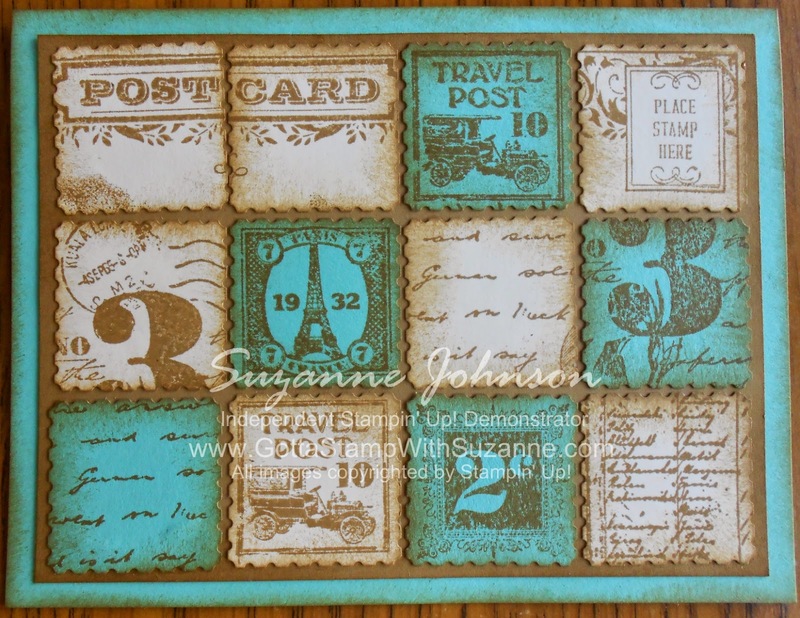 "POSTAGE DUE," "POSTCARD" and "THE OPEN SEA" sets, Baked Brown Sugar ink (stamping and spoinging), Very Vanilla and Coastal Cabana cardstock for postage stamps, Baked Brown Sugar background panel and Coastal Cabana card. 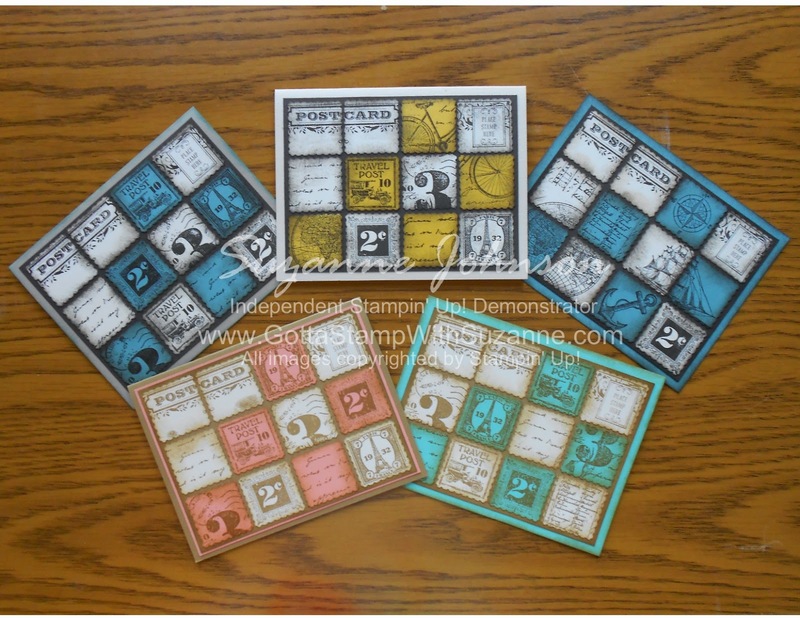 "POSTAGE DUE," "POSTCARD" and "THE OPEN SEA" sets, Early Espresso ink (stamping and spinging), Very Vanilla and Lost Lagoon cardstock for postage stamps, Early Espresso background panel and Lost Lagoon card. 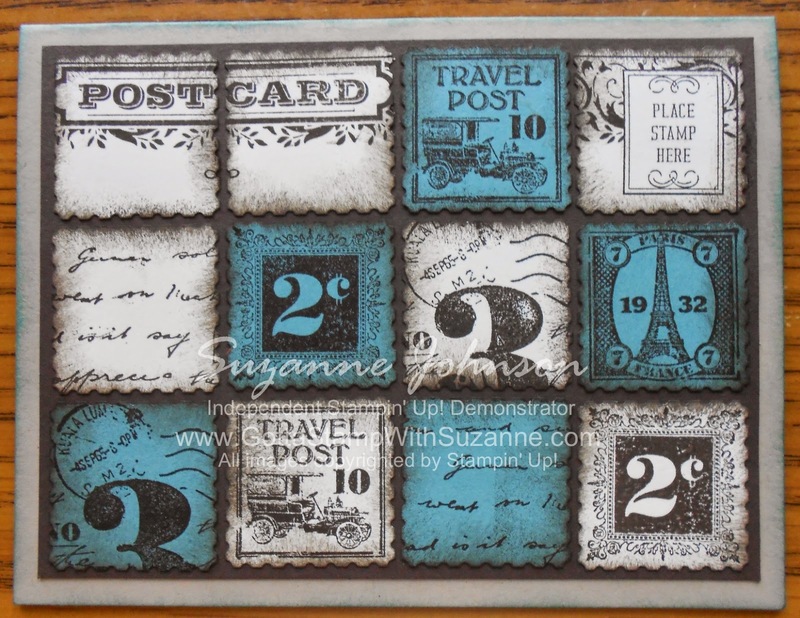 This card is not hard, but it is a little time consuming what with positioning the punch on the images, sponging all the punch-outs, and arranging/gluing all the punched stamps evenly on the background panel. Deanna used Stampin' Dimensionals to raise a few of the punched stamps, and she also embellished with a stamped/punched butterfly and a little sentiment-stamped tag. I planned to embellish mine but ended up liking the simpler look so much I decided to leave well enough alone. I hope you like the results and will leave me a comment!